Play real money online casino games at Intertops Casino and you'll automatically earn frequent player points. 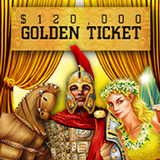 This month during the Golden Ticket casino bonus event they'll be awarding $120,000 in prizes. Every week the top 300 point scorers will get up to $500 each. Most of the prize fund will go to frequent players but, with random draws as well, everyone, including occasional players, can win. When the quest for the Golden Ticket end on April 3rd, one player will win a $1000 grand prize. It was a Golden Ticket that made Willy Wonka’s dreams come true and now Intertops’ Golden Ticket bonus giveaway is keeping the magic alive by awarding $30,000 in prizes every week. Frequent players win weekly bonuses up to $500; also weekly random draws that anyone can win. Contest details and current scoreboard rankings. Intertops, which has been trusted around the world for more than twenty years, recently unveiled a brand new web site with a modern new look and an all new Instant Play casino. Its new mobile casino features some of the most popular games from Realtime Gaming including the new Megaquarium, a tropical reef-themed game with bonus rounds that give progressively bigger prizes – 100X, 200X then 500X payouts.